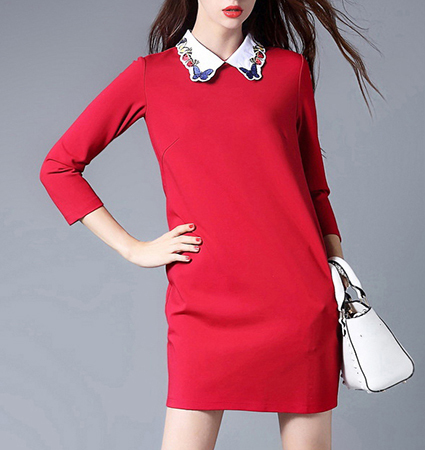 This cute women’s mini shift is a striking addition to your fall wardrobe. It is created from a high quality cotton blend fabric that feels soft to the touch and comfortable to wear for hours. The dress is presented in your choice of black or red. It has long, fitted sleeves and is cut in a straight, traditional shift style. A particularly attractive feature of this simply designed style, is the white decorative collar that is embellished with an embroidered floral theme. This dress is machine washable in warm water and may be tumbled dry on a low temperature setting. It is available in sizes Small, Medium, Large and Extra Large.